The finest manufacturers, exporters, traders and importers of this highly commendable range of UV Machines, APL Machinery Private Limited established its operations in the year 1995. The range of products, for reasons of quality, is manufactured in compliance with the set industry norms and guidelines, utilizing the finest raw materials and modern machines. The range comprises the finest UV Curing System, High Speed UV Curing Machine and UV Interdecks, having a high preference in the market. In addition to this, the range is marked at the most reasonable rate possible. The highly advanced state-of-the-art infrastructural facility at APL Machinery Private Limited, for the attainment of several of the firm’s predefined targets, has been laced with all the machinery needed. The facility has been parted into several highly operational units, for managing the firm’s operations in the best possible manner. Regular up-gradation of the facility, facilitates maximization of the firm’s reach in the market. Further, our ethical working habits and regular up-gradation of the facility, has helped us boost our presence and generate a huge and highly reputed client base, comprising Dabur India Ltd., Baidyanath Ayurved and Maxcare Laboratories. We deal in our APL brand. Our exporting countries are South Africa, Oman, Ghana & Germany etc. Under the leadership of our Chairman & Managing Director, Mr. C.P. Paul, attainment of a better position in the market, is simpler and efficient. In addition to this, his ability to understand the market, make commendable decision and manage, have helped us build our path to tremendous glory. Our highly skilled and experienced team of professionals helps us in the attainment of several of the firm’s predefined goals and targets. These professionals, for reasons of better management of the firm, have been sorted into a number of units. The division is commenced on the basis of the professionals’ area of expertise. In addition to this, the team is regularly trained, for reasons of keeping them at par with the ever changing market. 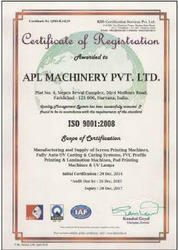 To us at APL Machinery Private Limited, providing quality to our clients is something of high importance. Thus we engage in the utilization of high grade raw materials and modern machines. This ensures the product’s performance, capacity, strength and service life. In addition o this, the offered range is processed through several rounds of quality examinations, where all manufacturing defects are eliminated with high level of precision. The highly advanced state-of-the-art infrastructural facility at APL Machinery Private Limited, undergoes regular up-gradation, for reasons of attaining a better position in the market. The facility parted into a number of unit, helps us in managing the firm’s operations in the best possible manner. Further, the facility, for reasons of attaining several of the firm’s predefined goals and targets, has been equipped with all the necessary machinery and equipment. We are considered in the market to be amongst the leading exporters, manufacturer, trader and importers of this commendable range of UV Machines. To live up to this market standing, the range is manufactured in compliance with the set industry norms and guidelines, utilizing the finest raw materials and modern machines. This ensures the product’s standard of quality. In addition to this, the range is priced reasonably and is delivered in the timeliest manner.